Designed for high-speed wet glass-cutting, the Vetro Blade is ideal for the professional glass contractor performing plunge cutting, trimming and various other glass-cutting applications. 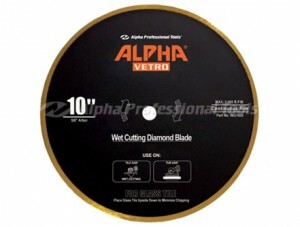 The Vetro Blade features a smooth continuous diamond rim and bond hardness ideal for glass and hard vitreous material. Waste is kept to a minimum because of the high quality cut that delivers straight and true cuts with minimal chipping. Our contractors all agree that this is the best 10″ blade on the market.